And just like that, SHRM 2018 has come to a close. The SHRM Annual Conference & Exposition was hosted in Chicago this year with more than 15,000 HR professionals from around the world in attendance, 200+ thought-provoking sessions, and four days of non-stop learning and networking. At TicketsatWork’s Booth #1806, we made fun our top priority. Conference-goers had the opportunity to learn more about our corporate rewards program and exclusive ticket offers, meet and greet Minions from Despicable Me, and win incredible raffle prizes! We loved every minute in the Windy City – but we’ve highlighted our top 5 favorite moments below. TicketsatWork’s interactive booth drew in the crowds at SHRM. Featuring a fun tunnel experience and a dazzling showcase of our top-selling products – including discount tickets to the best theme parks, hottest Broadway shows and iconic attractions – our team was there to provide demos of the products and help attendees learn about the unique benefit of joining TicketsatWork. It was great chatting with all those who stopped by and we look forward to seeing you next year! Once again, Universal Orlando Resort™ characters were the main attraction at TicketsatWork’s booth. Attendees had the opportunity to say hello to Despicable Me Minions Dave and Jerry and even snap a photo with them! It’s always a pleasure to join forces with the world-class theme park at SHRM. Four lucky winners won big at this year’s SHRM. The prizes included a 4-day, 3-night getaway for two to Universal Orlando Resort™, airfare, lodging and 3-Day Park-to-Park admission passes to experience Universal Studios, Universal’s Islands of Adventure and Universal’s Volcano Bay. 4. The hottest party at SHRM: dinner, dancing – and the Sandwich King! After a full day of SHRM, there’s nothing better than letting loose for an evening of food and fun to celebrate and thank our wonderful clients – and meet new ones. Held at the famous Willis Tower, our exclusive party featured celebrity chef and Food Network star Jeff Mauro, who entertained the crowds during his cooking presentation. His delicious pig candy BLT sandwich and inventive take on the Vietnamese sandwich were an absolute hit as appetizers. He mixed, mingled and took photos with guests throughout the evening. After dinner was served, it was off to the dance floor! Everyone was on their feet as a DJ spun move-worthy tunes. To cap off the evening, guests received private access to take a photo at the Skydeck, the 103rd floor of the Willis Tower, as well as fun gift bags, which included gift cards to TicketsatWork/Plum Benefits. Our exclusive SHRM party offered breathtaking 360-degree views of Chicago from above. With exciting history, shopping, dining and entertainment, Chicago was the perfect backdrop for this year’s conference. We hope to see everyone for the 2019 SHRM Annual Conference in Las Vegas! TicketsatWork is headed to Chicago for SHRM 2018! If you are too, then stop by our booth to get to know our team – we’d love to meet you. The four-day conference kicks off Sunday, June 17, when thousands of HR professionals descend into the Windy City for enriching development, networking and access to tools, resources and successful HR practices. It may be the world’s largest HR marketplace, but remember, you don’t have to tackle everything all at once. Instead, make the most of your SHRM experience with these insider tips. SHRM is your opportunity to gain more knowledge and stay up to date with the latest HR trends in order to make a lasting impact on your team. It’s crucial to do your research. Study up on the presenter. Take note of which sessions you’d like to attend or HR suppliers and vendors you’d like to connect with. Come ready with questions you’d like to ask. Getting organized will allow you to actively engage and participate. Before you head to SHRM, take a look at the list of attendees and exhibitors that’ll be at the conference. This is probably your one chance every year to establish new professional relationships, learn from industry pros and get to know your fellow peers. Make time to collaborate, exchange ideas and get inspired. Four days away from the office may be a lot for some, as work begins to pile up or emergencies arise – but remember to take advantage of your time at SHRM. Instead of focusing your attention on projects back at the office or responding to emails during conference sessions, set aside about one to two hours at the beginning of each day to take care of these items. Then close your laptop and focus your attention on all the exciting activities ahead. And, if you can, take the time to sightsee in Chicago – here’s our roundup of the top things to do in the Windy City. SHRM provides a wealth of resources to not only enhance your current knowledge, but also, to expand your scope. With so many sessions to choose from, mix it up! Attend sessions that are aligned with your own mission, so you can build on your areas of strength and identify your weaknesses. Don’t be afraid to stretch your mind. This is the time to gain entirely new perspectives and learn about innovative ideas and practices you could potentially use in the future. This is the biggest HR conference in the world. It’s easy to get lost in the hustle and bustle of SHRM, so stay up to date on what’s happening by following the Twitter hashtag: #SHRM18, and also @TicketsatWork. And, join the conversation! By actively engaging in the discussion and interacting with your followers and fellow conference-goers, you and your company can stand out from the pack. TicketsatWork is thrilled to announce we will be showcasing at the 2018 Society for Human Resource Management (SHRM) Conference in Chicago (June 17-20) in partnership with Universal Orlando Resort™. Together with the amazing theme park, we look forward to establishing new relationships and reconnecting with current clients at SHRM. Join us as we celebrate the summer season at our TicketsatWork booth, where conference-goers can enjoy an interactive tunnel experience, meet and greet beloved Universal Orlando Resort™ characters and enter for the chance to win incredible prizes and vacation packages daily. Best of all, learn about all the exclusive offers available to employees through our corporate benefits platform, so that you can save big on your next vacation! Don’t be shy! We’d love to hear from you before we meet in the Windy City. Follow us on @TicketsatWork for more updates, and visit www.TicketsatWork.com to get in on the fun – with benefits. 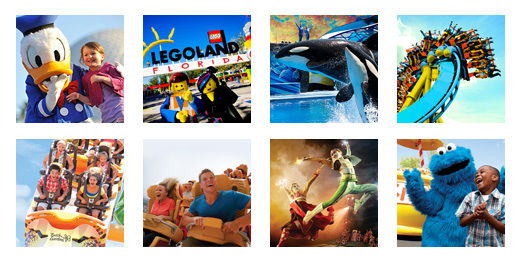 What’s better than experiencing Broadway shows, theme parks, movies and more? Saving big at the same time! 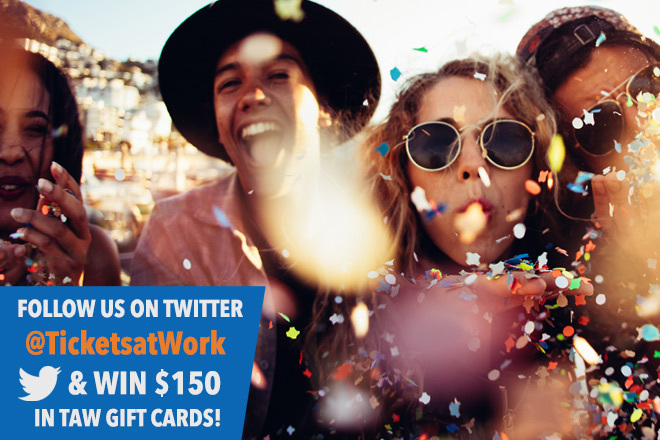 This is your chance to win a $150 TicketsatWork gift card to be used on any of our great offers. All you have to do is follow TicketsatWork on Twitter, fill out the form and share the sweepstakes on Twitter or via email to win. The sweepstakes end on January 15, 2018.